Cyber attacks have become more frequent, more sophisticated and more persistent. Like most businesses, you want to gain all of the benefits of the cloud but you don’t want this to be detrimental to your protection against cyber-criminals. 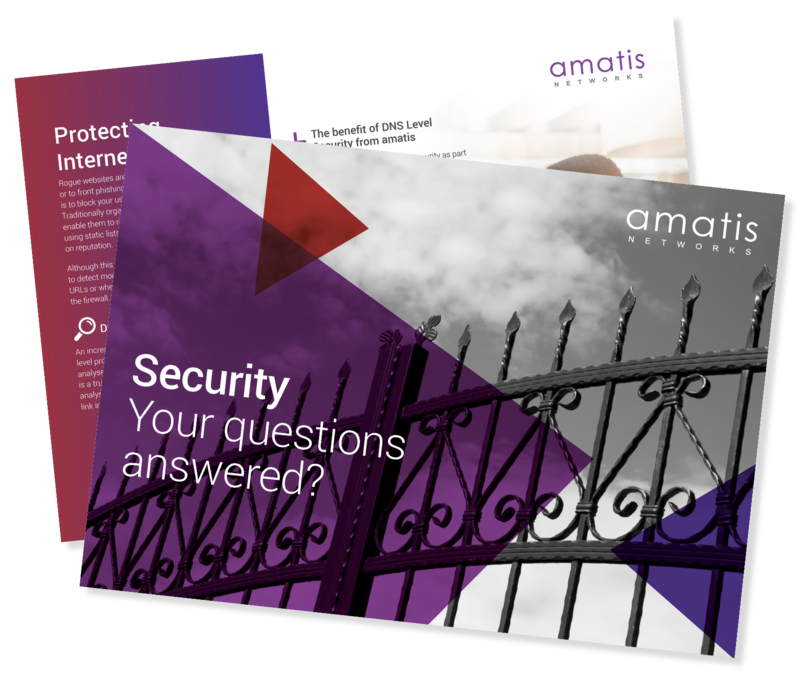 At amatis we protect our cloud and yours with the market-leading threat-centric cyber security solutions from Cisco, ensuring that you can prevent, detect and mitigate risk. We pride ourselves in taking every step feasible to protect our cloud environment. At the heart of this is the market-leading Next Generation Firewall technology from Cisco. We utilise Cisco Firepower NGFW appliances and software that combines proven network firewall technology with the industry’s most effective next-gen IPS and advanced malware protection. Not only does this provide our cloud customers with greater protection in preventing attacks, but it also provides unrivalled visibility into cloud activity, enabling any breaches to be detected, isolated and remediated significantly faster than industry averages. Our Cloud Security solution utilises Advanced Malware Protection from Cisco to significantly increase the prevention and detection of malware attacks. Malware is blocked at the point of entry using AV detection engines, one-to-one signature matching, machine learning and fuzzy fingerprinting. If there remains any doubt, then advanced sandboxing is used to isolate potential threats until they can be verified. This protection extends beyond the point of entry, continuing to monitor files entering your cloud environment looking for malicious behaviour and alerting us to this. Our Cloud Security is backed by market-leading intelligence from Cisco Talos who analyse millions of malware samples and terabytes of data each day. This context-rich knowledge base enables the Advanced Malware Protection to correlate files, telemetry data and file behaviour to proactively defend against both known threats and real-time emerging threats. We offer our Cloud Security as a fully managed service. This means that we monitor activity within your cloud and can quickly respond to alerts, isolating potential threats, investigating them and where required taking remedial action. As an ISO27001 accredited organisation, we take Information Security very seriously and extend our capability and best practices to protect our customers’ cloud environments.